Writing at different densities than disks were intended for, sometimes by altering or drilling holes, was possible but deprecated. The holes on the right side of a ​3 1⁄2‑inch disk can be altered as to make some disk drives and operating systems treat the disk as one of higher or lower density, for bidirectional compatibility or economical reasons. Some computers, such as the PS/2 and Acorn Archimedes, ignored these holes altogether. ​5 1⁄4-inch Perpendicular 1986 100 KB per inch ? The Commodore 8050, Commodore 8250, and Commodore SFD-1001 are 5¼-inch floppy disk drives manufactured by Commodore International, primarily for its 8-bit CBM and PET series of computers. The drives offered improved storage capacities over previous Commodore drive models. The Disk II Floppy Disk Subsystem, often rendered as Disk ][, is a ​5 1⁄4-inch floppy disk drive designed by Steve Wozniak and manufactured by Apple Computer, Inc. It went on sale in June 1978 at a retail price of US$495 for pre-order; it was later sold for $595 (equivalent to $2,290 in 2018) including the controller card (which can control up to two drives) and cable. 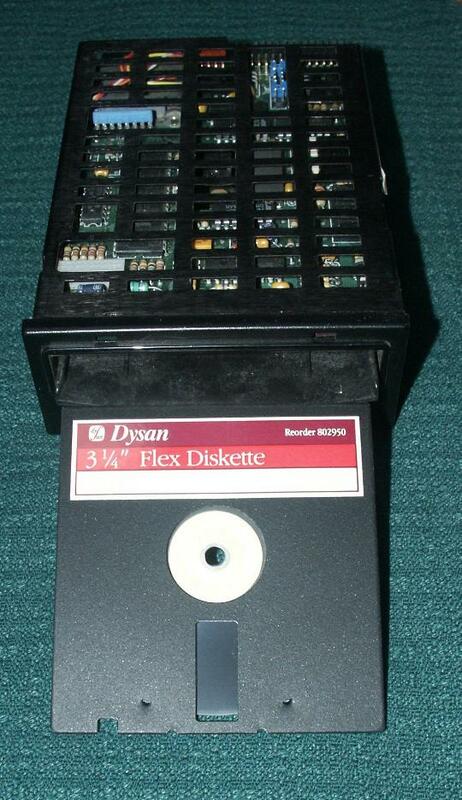 The Disk II was designed specifically for use with the Apple II personal computer family to replace the slower cassette tape storage. These floppy drives cannot be used with any Macintosh without an Apple IIe Card as doing so will damage the drive or the controller. Apple produced at least six variants of the basic ​5 1⁄4-inch Disk II concept over the course of the Apple II series' lifetime: The Disk II, the Disk III, the DuoDisk, the Disk IIc, the UniDisk 5.25" and the Apple 5.25 Drive. While all of these drives look different and they use four different connector types, they're all electronically extremely similar, can all use the same low-level disk format, and are all interchangeable with the use of simple adapters, consisting of no more than two plugs and some wires between them. Most DuoDisk drives, the Disk IIc, the UniDisk 5.25" and the AppleDisk 5.25" even use the same 19-pin D-Sub connector, so they are directly interchangeable. The only ​5 1⁄4" drive Apple sold aside from the Disk II family was a 360k MFM unit made to allow Mac IIs and SEs to read PC floppy disks. This is not the case with Apple's ​3 1⁄2-inch drives, which use several different disk formats and several different interfaces, electronically quite dissimilar even in models using the same connector; they are not generally interchangeable. Disk storage (also sometimes called drive storage) is a general category of storage mechanisms where data is recorded by various electronic, magnetic, optical, or mechanical changes to a surface layer of one or more rotating disks. A disk drive is a device implementing such a storage mechanism. Notable types are the hard disk drive (HDD) containing a non-removable disk, the floppy disk drive (FDD) and its removable floppy disk, and various optical disc drives (ODD) and associated optical disc media. (The spelling disk and disc are used interchangeably except where trademarks preclude one usage, e.g. the Compact Disc logo. The choice of a particular form is frequently historical, as in IBM's usage of the disk form beginning in 1956 with the "IBM 350 disk storage unit"). A floppy-disk controller (FDC) is a special-purpose chip and associated disk controller circuitry that directs and controls reading from and writing to a computer's floppy disk drive (FDD). This article contains concepts common to FDCs based on the NEC µPD765 and Intel 8272A or 82072A and their descendants, as used in the IBM PC and compatibles from the 1980s and 1990s. The concepts may or may not be applicable to, or illustrative of, other controllers or architectures. Floppy disk format and density refer to the logical and physical layout of data stored on a floppy disk. Since their introduction, there have been many popular and rare floppy disk types, densities, and formats used in computing, leading to much confusion over their differences. In the early 2000s, most floppy disk types and formats became obsolete, leaving the ​3 1⁄2-inch disk, using an IBM PC compatible format of 1440 KB, as the only remaining popular format. Different floppy disk types had different recording characteristics, with varying magnetic coercivity (measured in oersteds, or in modern SI units in amperes per meter), ferrite grain size, and tracks per inch (TPI). TPI was not a part of the physical manufacturing process; it was a certification of how closely tracks of data could be spaced on the medium safely. The term density has a double meaning for floppy disks. Originally, single density and double density indicated a difference in logical encoding on the same type of physical media -- FM for single, and MFM for double. Future use of the term "density" referred to physical characteristics of the media, with MFM assumed to be the logical format used. GCR was also used on some platforms, but typically in a "double" density form. 8- and ​5 1⁄4-inch floppy disks were available with both soft sectoring and hard sectoring. Because of the similarity in magnetic characteristics between some disk types, it was possible to use an incorrectly certified disk in a soft sectored drive. Quad density ​5 1⁄4-inch disks were rare, so it was not uncommon to use higher quality double density disks, which were usually capable of sustaining the 96 TPI formatting of quad density, in drives such as the Commodore 8050. Disks were available in both single and double sided forms, with double sided formats providing twice the storage capacity. Like TPI, "double sided" was mostly a certification indicator, as the magnetic media was usually recordable on both sides. Many (but not all) certified "double sided" 8- and ​5 1⁄4-inch floppies had an index hole on both sides of the disk sleeve to make them usable as flippy disks. A combination floppy disk and optical disc, known as a Floptical disk exists. The size of a ​3 1⁄2-inch (90 mm) disk, they are capable of holding close to 20.8 MB, but need a special drive. A floppy disk hardware emulator is a device that emulates a mechanical floppy disk drive with a solid state or network storage device that is plug compatible with the drive it replaces, similar to how solid-state drives replace mechanical hard disk drives. The floppy disk is a data storage and transfer device which was ubiquitous from the mid-1970s well into the 2000s. Besides the 3½-inch and 5¼-inch formats used in IBM PC compatible systems, or the 8-inch format that preceded them, many proprietary floppy disk formats were developed, either using a different disk design or special layout and encoding methods for the data held on the disk. A floppy disk is a disk storage medium composed of a disk of thin and flexible magnetic storage medium encased in a rectangular plastic carrier. It is read and written using a floppy disk drive (FDD). Floppy disks were an almost universal data format from the late 1970s into the 1990s, used at first as a primary data storage mechanism, and later mostly as a file transfer system as part of what became known as "sneakernet". Work on a drive that led to the world's first floppy disk and disk drive began in 1967 at a San Jose (CA) IBM facility, and introduced into the market in an 8-inch format in 1972. The more conveniently sized ​5 1⁄4-inch disks were introduced in 1976, and became almost universal on dedicated word processing systems and personal computers. This format was more slowly replaced by the ​3 1⁄2-inch format, first introduced in 1982. There was a significant period where both were popular. A number of other variant sizes were introduced over time, with limited market success. Floppy disks remained a popular medium for nearly 40 years, but their use was declining by the mid-1990s. The introduction of high speed computer networking and new formats like the USB thumbdrive led to the eventual disappearance of the floppy disk as a standard feature of microcomputers, with a notable point in this conversion being the introduction of the floppy-less iMac in 1998. After 2000, floppy disks were increasingly rare and used primarily with older hardware and especially with legacy industrial computer equipment. A list of all Apple internal and external drives in chronological order of introduction. This is a list of different floppy disk formats. The Macintosh External Disk Drive is the original of a series of external ​3 1⁄2-inch floppy disk drives manufactured and sold by Apple Computer exclusively for the Macintosh series of computers introduced in January 1984. Later, Apple would unify their external drives to work cross-platform between the Macintosh and Apple II product lines, dropping the name "Macintosh" from the drives. Though Apple had been producing external floppy disk drives prior to 1984, they were exclusively developed for the Apple II, III and Lisa computers using the industry standard ​5 1⁄4" flexible disk format. The Macintosh external drives were the first to widely introduce Sony's new ​3 1⁄2" rigid disk standard commercially and throughout their product line. Apple produced only one external ​3 1⁄2" drive exclusively for use with the Apple II series called the Apple UniDisk 3.5. NASLite is a free commercial Linux distribution designed to turn conventional x86-based computers with PCI interface into a simple network-attached storage device. It fits onto a single 3½-inch High Density floppy disk formatted to 1.72MB. NASLite boots from the floppy disk and runs in a 4MB RAM disk allowing for full capacity of the hard disk drives to be used as storage. NASLite supports serving files to clients running Windows, Linux, Mac OS X as well as others. Other versions are available which support different networking protocols, or booting the operating system from CD-ROM, USB Mass Storage device or hard disk drive. All versions of NASLite and its variants contain GPL'd and proprietary components. The GPL'd components are available to the end user per the GPLv2. In computer storage, some types of removable media are designed to be read to or written to by removable readers, writers and drives. Paper data storage (punched cards, punched tapes)Some removable media readers and drives are integrated into computers, others are themselves removable. Shugart Associates (later Shugart Corporation) was a computer peripheral manufacturer that dominated the floppy disk drive market in the late 1970s and is famous for introducing the 5​1⁄4-inch "minifloppy" floppy disk drive. In 1979 it was one of the first companies to introduce a hard disk drive form factor compatible with a floppy disk drive, the SA1000 form factor compatible with the 8-inch FDD form factor. Founded in 1973, Shugart Associates was purchased in 1977 by Xerox who then exited the business in 1985 and 1986, selling the brand name and the 8-inch floppy product line (in March 1986) to Narlinger Group, which ultimately ceased operations circa 1991. SmartMedia is a flash memory card standard owned by Toshiba, with capacities ranging from 2 MB to 128 MB. SmartMedia memory cards are no longer manufactured. SuperDrive is a trademark used by Apple Inc. for two different storage drives: from 1988 to 1999 to refer to a high-density floppy disk drive capable of reading all major 3.5″ disk formats; and from 2001 onwards to refer to a CD/DVD reader/writer. The terms DVD Multi, Super AllWrite and Super Multi are used to describe optical disc drives from non-Apple manufacturers. VHD (Virtual Hard Disk) is a file format which represents a virtual hard disk drive (HDD). It may contain what is found on a physical HDD, such as disk partitions and a file system, which in turn can contain files and folders. It is typically used as the hard disk of a virtual machine. The format was created by Connectix for their Virtual PC product, known as Microsoft Virtual PC since Microsoft acquired Connectix in 2003. Since June 2005, Microsoft has made the VHD Image Format Specification available to third parties under the Microsoft Open Specification Promise. The FD1771 is the first in a line of floppy disk controllers produced by Western Digital. It uses single density (FM) modulation and supports the IBM 3740 disk format. It is packaged in a 40-pin DIP. The Zip drive is a removable floppy disk storage system that was introduced by Iomega in late 1994. Considered medium-to-high-capacity at the time of its release, Zip disks were originally launched with capacities of 100 MB, then 250 MB, and then 750 MB. The format became the most popular of the superfloppy products which filled a niche market in the late 1990s portable storage market. However, it was never popular enough to replace the ​3 1⁄2-inch floppy disk. The final versions of the disk reached 750 MB, the capacity available on rewritable CDs, which was far surpassed by the later rewritable DVDs. USB flash drives ultimately proved to be the most popular rewritable storage medium among the general public due to the near-ubiquity of USB ports on personal computers and soon after because of the far greater storage sizes offered. Zip drives fell out of favor for mass portable storage during the early 2000s. The Zip brand later covered internal and external CD writers known as Zip-650 or Zip-CD, which have no relation to the Zip drive.